I thought the weather report for today was flurries but by the time we hit the trail, there was half an inch on the ground! Tren and his buddy Rick came over and I was planning on taking them down the Upper Gussy, then back on the Polly Brody to the Mullikin Trail and back to my house for some delicious, no preservative Berkshire Brewing Company Lost Sailor India Pale Ale, that I can now get in Newtown! Sorry if this sounds like a BBC commercial but I can't get enough of this stuff and now that I can get it where I live, it's great! Once again, got thank my buddy Mark aka MMCG for hooking me up with this brew last year at Trumbull. We set off down Hanover and picked up the Polly Brody and started to climb! This was the first time riding this fire road on the 'Horse and it behaved superbly, even with the shifting problems, that EMS Fairfield never resolved! I cleaned every stage and never hit the grannies. In fact, I have never had to use the grannies for any kind climbing. At the top of the last big climb we picked up the Upper Gussy and headed into the forest. I put a few markers on some trees but the trail is so well defined at this point I didn't think it was necessary. The death march began after the first revers roller/climb. Coming back the other way, it's a nice roller and off to the left there is a nice spot for wheelie drop. Then you go down and back up again onto another little ridge and then back down again. Some of the trail is sort clear through here and some of it is not. I tied a few more markers still we hit the ROW trail and then a few more in the area that Tren and I bypassed last week and then I was done! It was 4 O'Clock by the time we hit the ROW, cleaned the tunnel of love and hammered to roller at the intersection with the Blue Trail. We sessioned on it for a while, despite the slipperiness of having some snow on it. It was quite rideable, actually. The roller is about a 5 or 6 footer that you can come up from the south and then roll down, across the blue trail and back up the other side. Next week I will try to get some video of it. I also cleaned out a way to climb it as a trail challenge. Then we hammered home. I stopped the Edge at 2 hours, for four measly miles! Below is the trail track. Green is today's ride and red is last week. 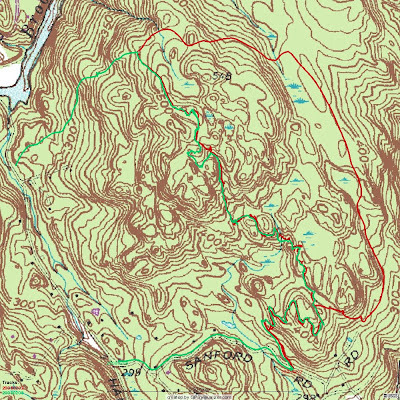 I have some analysis on some of the issues on The Upper Gussy Blog page that talks about the stream crossing and ROW trail that you might find interesting. The Iron Horse functioned really well in the snow! The only problem I had was when snow would build up between the rear tire and the seat tube, did I have to stop and clean it out, but that only happened while walking. When riding, snow built up but it didn't impede my ability to pedal. The 'Horse hit a 100 miles today! The Crank Brothers out performed Shimano SPDs hands down. Both Tren and Rick had Shimanos and they were constantly having problems. Whereas I never had a problems clipping in! I did not test ride the Fetish Fixed-ation 69er today. Might try it tomorrow morning and just ride the Polly Brody. It's still a very useful bike to have ready to open a beer bottle without any complaints!